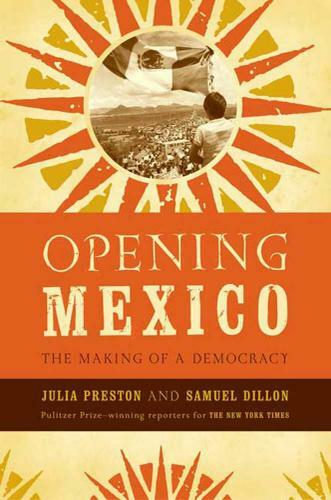 Opening Mexico is a narrative history of the citizens' movement which dismantled the kleptocratic one-party state that dominated Mexico in the twentieth century, and replaced it with a lively democracy. Told through the stories of Mexicans who helped make the transformation, the book gives new and gripping behind-the-scenes accounts of major episodes in Mexico's recent politics. Mexico's Institutional Revolutionary Party, led by presidents who ruled like Mesoamerican monarchs, came to be called "the perfect dictatorship." But a 1968 massacre of student protesters by government snipers ignited the desire for democratic change in a generation of Mexicans. Opening Mexico recounts the democratic revolution that unfolded over the following three decades. It portrays clean-vote crusaders, labor organizers, human rights monitors, investigative journalists, Indian guerrillas, and dissident political leaders, such as President Ernesto Zedillo-Mexico's Gorbachev. It traces the rise of Vicente Fox, who toppled the authoritarian system in a peaceful election in July 2000. Opening Mexico dramatizes how Mexican politics works in smoke-filled rooms, and profiles many leaders of the country's elite. It is the best book to date about the modern history of the United States' southern neighbor-and is a tale rich in implications for the spread of democracy worldwide.